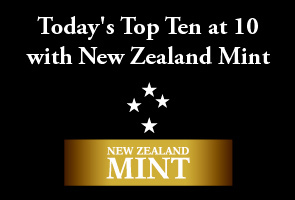 Here's my Top 10 links from around the Internet at 1 pm today in association with NZ Mint. My must read today is #2. It's the best summary I've seen recently of the problem with the global economy. My apologies for no Top 10 yesterday. I got whacked by the Labour/Green power bombshell. 1. Show us the growth - We've had the money printing. We've got the asset bubbles. Now show us the growth. This is the missing link in the grand strategy. Central banks and governments have stabilised the global financial system. They have pumped back up the asset bubbles. Now they need this activity to spread to the real economy in the form of more consumer spending, more income, more jobs and, more broadly, real economic growth. They are hoping the wealth effect will kick-start the global economy and they will be able to (very carefully and accurately) withdraw that stimulus without causing an inflationary outburst. But so far that wealth effect hasn't restarted real growth. So why isn't it happening? In my view, there's three drags on the real economy that mean the money isn't leaping the species barrier from asset markets to the real economy in the developed first world at least. Firstly, the scale of the household and government debt now weighing down the developed world is huge. People are repaying debt, or at least aren't taking on more debt. Secondly, the ageing of workforces and population structures in the developed world is slowing growth because older people save proportionately more and are relatively less productive. Thirdly, the evolution of global capitalism towards outsourcing production costs to lower wage economies is pressing down on real wages for lower to middle income groups. These are the groups who do most of the spending in the Western World's consumer economy. With more of the income share accruing to the top 10%, less of that is being spent on those consumer goods. That is slowing growth. But none of this suggests how it all might end. Will this deluge of fresh money eventually catch fire? Or will consumers be encouraged to take on more debt on such a scale that it triggers another 2008 bust that wipes out a banking system even more dominated by Too Big To Fail banks? Or will consumers and voters revolt in such as way as to derail the strategy? Will they force a redistribution of wealth and income so the consumer-dominated economy can resume its growth in a sustainable way? 2. Here's Jesse Eisinger writing at New York Times about the risks of asset bubbles. He covers similar themes.Are we moving from the crash to the bubble, dispensing with that pesky economic recovery thing altogether? The Federal Reserve is well into its third round of “quantitative easing,” in which it buys longer-term assets to bring down long-term lending rates. We are about five and a half years into the Fed’s extraordinary monetary policies (its out-of-the-box lending programs began before the crash, in late 2007). The effect the central bank hopes to produce hasn’t materialized. Despite modest growth, the economy remains a wellspring of misery, with mass unemployment, wage stagnation and factories going unused. In March, a smaller percentage of working-age people were actually working than at any other time since 1979. Through its unconventional policies, the Fed is trying to ease the crisis. It has succeeded in driving down lending rates. Ben S. Bernanke and company would also like to kindle inflation expectations, spurring people to buy and companies to invest today instead of waiting until tomorrow. Supposedly, all of this will drive a self-sustaining economic recovery. Instead, the Fed has kindled speculation. Investors are desperate for yield and are paying up for riskier assets. In areas like real estate, structured finance and equities, the markets are ahead of the fundamentals. It doesn’t look to me like a bubble yet. But I would call it the Dysplasia Stage, abnormal growth that looks precancerous. It’s not just an economic or financial issue, it’s cultural and psychological. We seem to have unlearned what real growth is and simply substituted speculative bubbles. Policy makers are either paralyzed or barrel forward because this is all they know how to do. 3. Will the trickle down theory work? - Here's Eisinger again on whether money will trickle down the from wealth to the broad populace to restart growth. Maybe not. Has the Federal Reserve monetary policy reached the average American? To a certain degree, yes. Many Americans have been able to refinance their homes. Those auto loans may be helping people get to and from work. But the economic effects are modest for the size and scope of the effort. Investors glory in the asset inflation. The most pronounced effect of low mortgage rates has been to allow people with good credit and low debt to refinance multiple times over the last few years. Stock ownership is concentrated among the wealthy; junk bonds and collateralized loan obligations only more so. 4. Oops - It seems the key research done in 2010 that convinced many governments to embark on austerity to reduce their debt loads and avoid economic slowdowns was based on some basic errors. It's a bombshell for the debate about whether government austerity just worsens the debt load, or will actually boost economic growth in the longer term. And it seems New Zealand's experience has a starring role in the mistakes that Reinhart/Rogoff made. In their work with a sample of 20 advanced economies over the postwar period, they report that average annual GDP growth ranges between about 3 per cent and 4 per cent when the ratio of public debt to GDP is below 90 per cent. But average growth collapses to -0.1 per cent when the ratio rises above a 90 per cent threshold. In a new working paper, co-authored with Thomas Herndon, we found that these results were based on a series of data errors and unsupportable statistical techniques. For example, because of straightforward miscalculation and unconventional method of averaging data, a one-year experience in New Zealand in 1951, during which economic growth was -7.6 per cent and the public debt level was high, ends up exerting a big influence on their overall findings. When we performed accurate recalculations using their dataset, we found that, when countries’ debt-to-GDP ratio exceeds 90 per cent, average growth is 2.2 per cent, not -0.1 per cent. We also found that the relationship between growth and public debt varies widely over time and between countries. 5. So Keynes was right then? - Pollin and Ash conclude, essentially, that this mistake blows the austerian argument out of the water and takes us back to realising Keynes was right after all. 6. The other side of the story - Reinhart and Rogoff have acknowledged the excel spreadsheet error, but are defending their work. Bloody Microsoft. Here's their rebuttal to the rebuttal. We are grateful to Herndon, Pollin and Ash for the careful attention to our original Growth in a Time of Debt AER paper and for pointing out an important correction to Figure 2 of that paper. It is sobering that such an error slipped into one of our papers despite our best efforts to be consistently careful. We will redouble our efforts to avoid such errors in the future. We do not, however, believe this regrettable slip affects in any significant way the central message of the paper or that in our subsequent work. 7. The problem with the new plutocracy - Here's Chrystia Freeland from Reuters talking the implications of the astonishing growth over the last two decades of a global and meritocratic super-rich elite. 8. Totally Jon Stewart on Zero Dark Hurty. 9. Margaret Thatcher and the crumbling case for Austerity Economics - Here's John Cassidy at the New Yorker. 10. Totally Clarke and Dawe on Margaret Thatcher's legacy. She might come back and sue for defamation. a) things don't seem to be at a bad way for an ecomony until 120%, not 90%. b) high levels of debt are not at all predictive for how long things are bad for. Crikey Bernard ..? where is everybody..? Today's message is ...When anyone percieves an obligation to you....take full advantage.! news that the child was his and demanded that he did something about it. The butcher promised to provide her with free meat until the boy was 16. The woman agreed to his proposal. the butcher, "It's my 16th birthday today." "I know," said the butcher with a smile. "I've been counting the days off. last free meat she'll get and watch the expression on her face." When the boy arrived home, he told his mother what the butcher said. getting free meat, free vegetables, free newspapers, free bread, free milk, free alcohol, free groceries and free fuel for the past 16 years and watch the expression on his face!" It's friday why not.... I claim no credit for this. A5: None. Because, look! It’s getting brighter! It’s definitely getting brighter!!! 1 through 7 are the same thing. Failure to see big picture. Reminds me of the folk who continue to assert that the planet - dinosaurs and all - is 4000 years old. The question is about QE long-term; sure, it's an attempt to reduce faith in saved moolah, presumably to drive folk into consuming (Martenson puts it very well). The problem is that if they did attempt to consume on anything approaching our historical global peak, we would be looking at re-visiting the brief hiatus around the time of the China Olympics - where you could trade dead batteries and scrap for serious wealth. It didn't last long, and neither could a repeat. I suggest a growing number of folk 'get' this, and aren't spending, are paying down debt, and growing more vegies at home. In the 20-30 age group, that's an overwhelming majority of those I meet. The problem with the global economy is the global economy, economics and society itself. Good reads but also requires one to be able to challenge their own beliefs. http://dieoff.org/page134.htm - Complexity, Problem Solving, and Sustainable Societies. The recently annouced NZ Power Proposal has been met with a positive response from members said an unnamed spokes person at a hastilly rescheduled press conference of the New Zealand Cafe Users Association held at the Rotten Bean Cafe Ponsonby. Throughout the morning the venue had been moved several times due to disagreements amongst memebers as to who could make an acceptable coffee in the CBD. A spokesperson said that the NZ Power proposal was great news for the cafe industry. At an average of $330.00 in savings per household and around 1 million households in the country the extra spending if directed towards Flat Whites would result in the largest increase in Coffee consumption ever seen in a developed economy. Around 74 million additional Lattes, Flat Whites and Long Blacks could be expected if the industry does its job and captures the resulting savings of the NZ Power proposal. We are expecting a massive investment in Espresso Machines, Cafe Stools to meet this new demand. New Zealand are already world leaders in coffee consumption and this opportunity should be siezed with both hands. Addition sales of macaroons, minature Chocolate Eclairs and petite cup cakes are also expected. Why keep searching for academic explanations for something that is fairly simple. You can do all the spread sheets you like, but (to use an analogy) if you have two flat tyres on your car, you can change the oil in the engine as many times as you like, it wont fix the problem. In simple terms, in their rush, the Central Banks "bailed out" financial institutions without applying any financial-hand-cuffs, and secondly, Benyamin Shalom Bernanke didn't know what he was bailing out. Paulson and Co pulled a swifty over Bernanke. He, Bernanke, didn't understand CDO's and CDS's or the extent of them. He didn't know he was backstopping $600 Trillion of toxic derivatives. Paulson knew. What Bernanke and Co did was to put an aggressive safety net under the banking system in the hope that everything would stabilise and normality would resume within 6 months and so avoid the worst effects of deleveraging. What he didn't know was the new-world-paradigm of slicing and dicing of CDO's. He didn't know the effect of unwinding those derivatives would hit those at the bottom of the totem pole the hardest. They, the proletariat, can't drive their car because it has flat tyres, while Bernanke keeps pouring more and more petrol in the tank. Those on the top of the totem pole are still waiting for asset values to get back to where they were pre-GFC. Then they will start to unload. When the financial elites can finally unencumber themselves of these toxic assets you might see some conventional activity and conventional answers.. The question is:- where in the scheme of things is the deleveraging-clock pointing? Mist what do you make of Xero? Are you thinking there is no need to go beyond MYOB. Xero cap at $1.3 bn. So 38 Xeros equal all bank debt lending/investment to nz farms. Yes wealth to be had once once income not related to own labour or time. "Christine Lagarde said she supports policies announced by the Slovenian government and dismissed investors’ concern that the country will be the next euro-area nation to receive a bailout."